It's no secret that zombies are all the rage today and continue to gain more traction in pop culture. There are few better ways to depict the demise of our society. Along with putting the last few survivors in dire straits, it also offers plenty of room for allegory about our soulless modern times. Where did it all begin? There were plenty of early examples, including famous titles like Frankenstein. However, the modern concept of zombies really goes back to George Romero's Night of the Living Dead. That low-budget 1968 release was shot in black and white and remains the standard today. It's received plenty of critical acclaim and was highly influential, but it doesn't really fit in the post-apocalyptic genre. 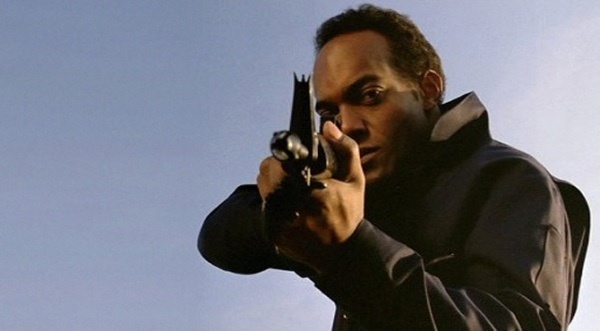 A better choice is Romero's 1974 follow-up Dawn of the Dead, which shows a world devastated by the rise of zombies. This is a seminal film, yet I've never seen it. It's time to rectify that omission right now. Will it live up to the monumental hype? I'm not a huge fan of horror films, so it won't be an easy task. Even so, this film has been on my watch list for an extremely long time. Let's head to the mall and see if there's any better place to be during the end of civilization. The world is overrun by zombies, and citizens are freaking out while trying to escape this mess. Total chaos has taken over, and there's little hope of finding a safe haven. A small band of mismatched survivors work together and discover a possible solution. It's one of our greatest national treasures, the shopping mall. SWAT team members Roger (Scott H. Reineger) and Peter (Ken Foree) meet up with regular folks Stephen (David Emge) and his girlfriend Francine (Gaylen Ross). They venture into the countryside and discover the well-stocked mall. There are still plenty of the walking dead to eliminate, but there's at least a chance in this consumerist haven. Of course, others are likely to have the same idea. The idea of the slow-moving zombies is silly, but Romero sells the chaos of a world falling apart. The military shoots civilians and tries to maintain control when stability is impossible. This is a low-budget affair, so there are no grand shots of massive empty streets like something in I Am Legend. Instead, Romero takes a personal approach and shows one group as they avoid the hordes. Unlike the fast-moving enemies in 28 Days Later or the 2004 remake of this movie, the zombies are pretty easy to avoid if you stay on your toes. People can knock them over and wade through them without too much trouble. However, getting overconfident is the easiest way to become the next zombie feast. The Monroeville Mall is a believable setting for a sanctuary, though it also feels like a prison once the excitement disappears. The news reports are a clever device to explain the devastation under budget constraints. Once those broadcasts end, we know this society is heading towards oblivion. Although they're mostly lacking in the charisma department, the main four characters are believable. Stephen and Francine are pretty inept in killing zombies and don't become superheroes once the disaster escalates. Roger has the skills, but he's also careless and seems unconcerned with the dangers of the zombie horde. His character is a little obvious yet is the type of guy who would survive the initial catastrophe. The most convincing performance comes from Ken Foree as Peter, who becomes the third wheel to Stephen and Francine. The scene where he angrily strikes a tennis ball against the wall shows the downside of living inside a confined mall. They may be safe from the dead, but they're also trapped in the frustrating environment. On the other hand, Francine is problematic because she's such a passive character. Gaylen Ross does solid work yet is given little to do before the final onslaught. Romero throws us into the confusion at the start, and he wisely pares down the story to the small group. This focus allows us to get to known these characters and care about their survival. This isn't a slasher film where we wait to see the next killing. The quest is very simple and solely about survival. They aren't trying to locate the reasons for the epidemic. Finding a safe haven from the walking dead is the only goal. Although it's a basic plan, it remains interesting because we easily connect with this pursuit. The mall is a great choice because it's well-supplied and has limited entrances. Once the zombies have been removed, life is good. However, there's only so much to do for the small group. It's these quiet moments that lift this story beyond the horror and satire. Francine and Stephen sit motionless in the bed and are clearly struggling to connect. She's pregnant and facing the looming sense of dread from that predicament. Who could raise a baby in this world? The dead aren't going away, and the survivors are probably just delaying the inevitable result. 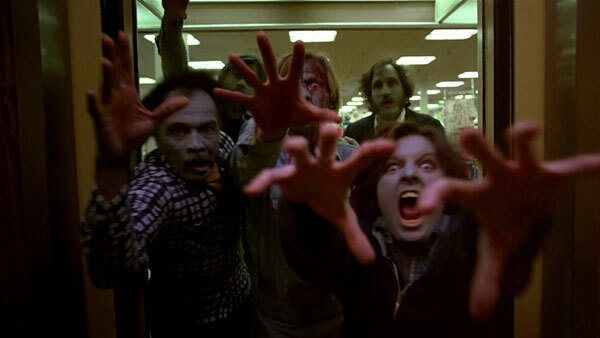 Dawn of the Dead originally received an X rating, so it was sent to theaters with no rating to avoid the stigma. The reason is the nasty violence, which includes zombies ripping the guts right out of a doomed biker. Viewed today, the effects remain grisly but lack the shock value. When a head explodes from a shotgun blast, it's impressive but also pretty comical. Romero and Tom Savini deliver a unique style of violence that's bloody yet feels disconnected from reality. The vivid reds sell the violence but hardly lead to nightmares. That said, there are plenty of memorable deaths that rank among the most creative in the genre. Heads are sliced with machetes and destroyed with all manner of blunt object. There are some funny gags, including a biker more focused on getting his blood pressure taken than escaping the zombies. After they eat him alive, the monitor finally registers a big zero. This sense of fun keeps the story from becoming too ugly and makes for a fresh experience. The most unique part of this film is Romero's satiric take on modern consumerism. Even after they've been turned into zombies, the dead are drawn to the mall. Their lifeless walks among the stores aren't that different to how they shopped before the disaster. When the bikers invade the mall in the final act, they're more concerned with the material objects. This approach ends up being their undoing. Romero's also criticizing the urban sprawl that was taking off in the '70s. The overhead shots of the hordes stumbling in the countryside towards the mall clearly makes that point. They're lost their souls to the consumerist culture and are only connected to that lifestyle. It's refreshing that Romero makes these points within the context of an entertaining movie. The characters don't make speeches about our destructive practices, so it's easy to ignore the satire if it doesn't interest you. The story works as both an allegory for society's problems and as a straightforward horror film. Romero also uses humor to keep the message from being too heavy-handed. The impact is stronger because we're having a good time and aren't dragged down by the weight of the message. My favorite zombie film. I know it is probably not the best zombie film but it holds a lot of sentimental value. I know that sounds weird but this film was my first exposure to the genre. My brother and I somehow came to actually own this on VHS back in the early 80's it was one of about 6 films we owned. As you can imagine I have seen this a few times. I'm glad to hear that you're a fan. I'm amazed that it took me so long to check out this movie. It's definitely a good place to start with the genre. The effects might seem dated compared to what's on the screen today, but the impact is still there for sure. This is my favorite zombie film, too, and one of my favorite horror films. I have fond memories of this one, too. Specifically, I remember my older brother sitting in the television room drinking beer and cheering for the zombies. Romero deserves more credit than he gets from non-horror junkies. The best line in the film, tying into the overall consumer theme, is when one of the guys asks why the zombies have come here and another replies that it's a place that was important to them during their lives. Steve, that is a great line and gets at the heart about Romero's saying with the zombies. 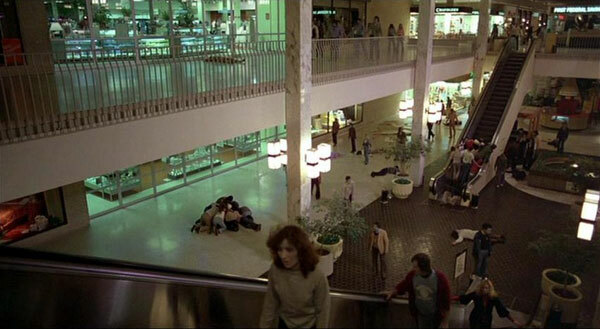 The shots of them stumbling around the mall feel eerily familiar, especially from the '80s. Now you can just give the zombies smart phones, and we're good. What struck me since I'm used to the Walking Dead and 28 Days Later was just how inept the zombies really were. When they actually get the characters, it's through pure numbers or getting lucky. Watching the guys just run through and knock them over was great fun. That's the joy of old school zombies, and the reason I love them so much. One zombie is comic; a thousand zombies is terrifying. Definitely. Getting stuck in a confined space (or on the ground) with the horde on its way is awful, even when they're slow and clumsy. Love Love Love Dawn of The Dead. Im so glad you got a chance to watch it. I m glad you got the satire element that Romero was trying to convey in this picture. Fast zombies should not be called zombies because dead matter shouldnt move so fast. Vern, now you're getting into the question of whether 28 Days Later is really a zombie movie with the Rage Virus involved. There's been some fierce debate on that subject. 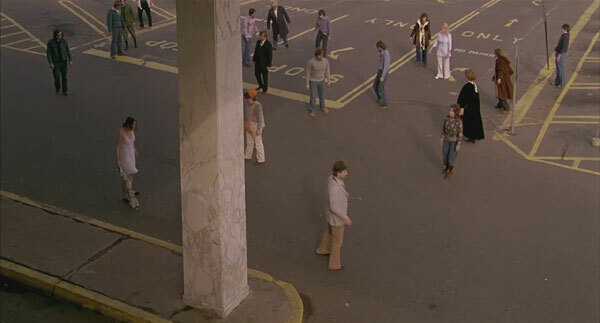 With Dawn of the Dead, the satire was great fun and added a lot to it. I'm glad that I was finally able to check it out. I actually got into Romero's work very late as well. It wasn't until last year when I did a horror paper at university (as a genre study) that I finally saw Dawn of the Dead. I, like you, wasn't a big fan of a lot of horror but doing that course made me respect a lot of cinema I never thought I would (including Hostel as a post-9/11 film). Great post though, Dan. It may be dated, but in a world full of zombie films we have a king. Leith, I also built more respect for horror in college in a film class where we dug into Halloween and a few others. I admire the genre yet still don't watch nearly as many as I should. I've also seen Day of the Dead and am curious to check out some of Romero's more recent films. I doubt they'd hold a candle to Dawn of the Dead, but I'm sure it would be interesting. Thanks for stopping by! Thanks! It was definitely one of my largest blind spots, so it was cool to finally check it out. I definitely recommend it, even if you aren't a huge fan of horror films. Thanks for such a great review Dan! I bloody love this film and its easily up there with the best zombie films of all time. I've got to say though, if I had to choose between this film and its predecessor 'Night of the Living Dead', I'd have to go with the latter. 'Dawn' may be the better film but you can't beat that ending. What do you think? David, I'm sad to admit that I haven't seen Night of the Living Dead yet. It's definitely one of my larger blind spots. From what I've heard, most consider the first a classic but prefer the sequel because of all the satire. Thanks! This is my favorite zombie film of them all. The one I can watch over and over again, the one that I could probably close my eyes and quote the dialogue from. It is for all the reasons you mentioned, but also for one of the most important reasons of them all. This movie introduced us to probably one of the greatest, if not THE greatest character ever invented for a zombie film, Roger. The character is just great, and really serves as a glue that holds everyone together for a time. I like that he works at keeping the peace between all four characters, especially in the scenes where the experienced Peter is picking on the inexperienced Stephen. Also, he behaves like most of us would if we were locked alone in a department store. Running around whooping while we filled our carts with stuff we wanted, but didn't need. The interplay between himself and Peter is letter perfect, and you can tell the two of them were just as good friends behind the scenes as they were on camera. I liked the character far before they entered the mall, but when he slides down the escalators whooping like a five-year-old, it was cemented. There's never been a character that can quite rival Roger. Sure you've got your Ben, Peter. In other films you've got Tallahassee and in the Walking Dead, there's the fantastic Norman Reedus as Darryl Dixon. But for my money, in the apocalypse, Roger would be one of the people I'd want in my group. Thanks for the extended comment! It's interesting that you mention Roger. 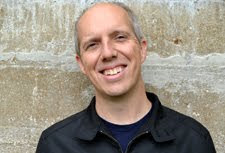 The actor who played him, Scott Reiniger, has only six screen credits (two being Dawn of the Dead and the remake). I've only seen this movie once, so it's hard to say where it would fall if I did a ranking of zombie films. It's definitely up there, though.